In September 2007 we travelled to Ethiopia in order to set up a free radio station for education, information and the spread of local culture. The radio station is located at the Jimma University in Jimma (in the south-west of Ethiopia). The programming is developed in cooperation with students and teachers from this university, local NGO's and the local community. Dutch students and teachers came and will come over to Ethiopia to participate in the project. Such intercultural cooperation can enhance the radio's reach and stimulate knowledge sharing. In the past the mass media have played a large role in reducing the knowledge gap and improving the development of the democracy in Western European countries. In Ethiopia radio can fulfil this function as well. Radio has been employed in different situations as a means to support education, information and the spread of local culture. We are striving to develop such a technique for the people of Ethiopia together with Ethiopians themselves. HIV/AIDS is a major problem in Ethiopia, and still there is a great shortage of knowledge about the causes and possibilities for prevention. We want to create awareness about this and other health problems by issuing it on the radio in the local language. In this way we will try to get rid of the taboo and give the people a fair chance to choose. Ethiopia is a young democracy in which people aren’t used to free media. By making radio with them we can work on the feeling that you can actually be of influence in other ways then voting or demonstrating. Supplying different channels for information is vital for a healthy democracy. It is important that the people of Ethiopia discover the possibilities of free media themselves. They live in the country so they should give rise to the new possibilities media can give them. In this process we can find out what’s possible and in the same time, help people. The choice for the usage of the medium radio is obvious since radio is the most important and far reaching mass medium in Ethiopia. It s success can be attributed to the modern interpretation of the traditional oral culture. The reach of newspapers and magazines is particularly limited in Ethiopia because of the high percentage of illiteracy. Besides, radio is an easy and relatively cheap medium which can reach many people, whereas newspapers, in the second poorest country in the world, are hardly affordable. Because radio already plays a large role in Africa, programs can be exchanged, people can make use of shared infrastructure such as a news department, program and music database or educational courses. Radio is also fast, mobile and uncomplicated to create and to receive. Radio has already proven itself to be quite effective in Ethiopia. The radio soap opera Yeken Kignit, which adresses problems like family planning, HIV/AIDS and womans rights, was very populair in Ethiopia. Research from the Population Media Center showed that this soap opera had a great positive influence on listeners behaviour. 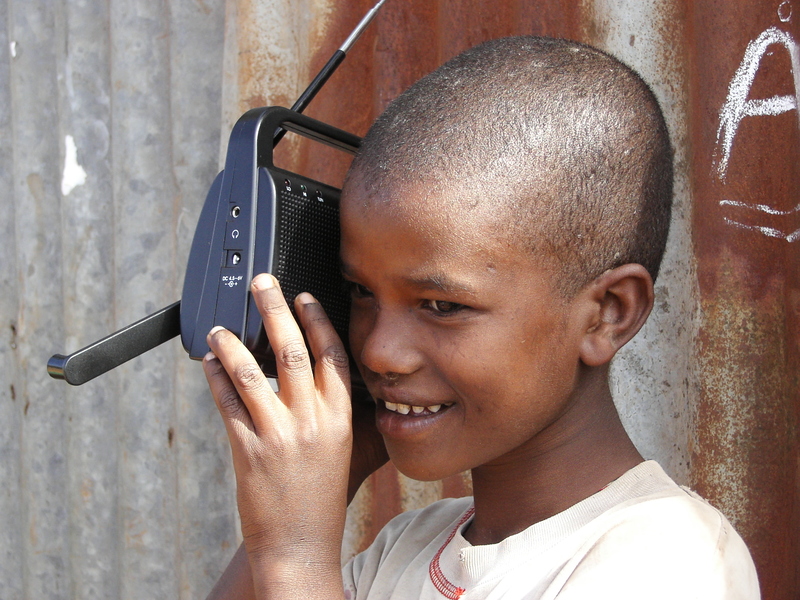 Our aim is to start a radio station in Jimma, which will be fully operational in December 2007. The programs that will be transmitted have three important themes. •	Education: certain subjects will be thought via the radio like: English language, world orientation, biology, etcetera. This is not only meant for children who can’t attend a school but also for adults who didn’t go to school and other curious people. •	Information: : the radio will be used to inform people about important issues like HIV/AIDS, hygiene, fistula problems, woman circumcision, food and health. •	Spread of local culture: a radio station also needs entertainment and identification for the public, in this part there will be space for music, stories, interviews and radio documentaries. We also strife to get Ethiopian and Dutch students and professionals together and let them learn from the cultural differences by working on a common goal: making high quality community radio in order to stimulate international cooperation, sustainable development and knowledge sharing. HOW DO WE REACH THE PEOPLE? •	Make the radio-programs available on the internet. •	Build a big transmitter and support transmitters in smaller communities to enhance its reach. Mass media play a large role in modern society; they inform us, educate us and entertain us. Unfortunately more then half of the inhabitant of the people of Ethiopia can't read, so the papers can't reach them. TV may even be more out of reach for the Ethiopian with an average income. Since we believe in the positive impact that media can have on the development of people, we want to facilitate a community radio station in our region. Recent research has shown that radio can have an enormous impact on people's behaviour, and since radio perfectly coincides with our oral tradition we think it's the perfect means for a fruitful approach of our people. The Jimma University uses community based education. They train professionals who can address community's problems and bring about change in the community through active community participation. Community radio can be a perfect means to accomplish knowledge sharing and community participation. Students from different faculties will engage in making radio programs in cooperation with the local community members, local NGO's and other institutions. The local identity of community radio makes it accessible for the people and applicable to the local situation. Community radio can help ordinary people to get access to appropriate information which brings many economic and social benefits and supports community development. The radio station will issue relevant social, health and behavioural issues or a combination of such as there are HIV/AIDS, personal hygiene, STD's, STI's, harmful traditional practices, gender equality, human right issues, erosion, general education, economic education, agricultural information and all other sorts of information, education or edutainment which can be useful for the community. Apart from that, community radio can be a means of developing and protecting the regional and local identity, culture and character. Furthermore, the community radio station can help Jimma's people, especially the poor, to participate in the communication processes en consensus building about issues that affect their lives, and stimulates them to help themselves and each-other. By doing this we can emancipate the population and work towards a more consensus minded community which has an high awareness of what is going on in the community. This results in a more active engaged civil society in which people feel at home and for which people feel more responsible. Population research from the Gilgel Gibe Field research Center has shown that 36% of all Ethiopian households has got a radio. To reach all the members of the community, including the ones who cannot afford a radio, windup radios will be supplied to listener groups. These groups will also be used to evaluate our programs and research in what way the behaviour of people has changed over time. Hailemariam, A. (2005). The Effect of Radio Serial Dramas on Reproductive Health Behavior: Key Findings from the Evaluation. Population Media Center: Addis Abeba.